For many homeowners and rental property managers, trying to find the right person to call to deal with interior home repair and maintenance issues is a tough job. In many cases, calling a specialist, like a plumber, electrician, or furnace repairman isn’t easy. Many trade specialists and companies aren’t eager to handle small jobs for residential properties, and some even charge high minimum fees to discourage such calls. That can lead to making call after call, just trying to find the right handyman to handle the interior repair or remodeling job you need to have done. HandyQuick has the solution you need. Our company was founded on providing on-call services to some of the TOP residential property management companies in Minnesota. From a single interior repair to an entire list of repairs you’ve been putting off, our talented handymen get the job done. Grab a notepad and take a look around your home. Jot down all of the repair jobs you’ve been thinking and worrying about, and then call us. You can count on our skilled craftsmen to handle every job on your list professionally, efficiently and affordably. From deep cleaning services to assisting you in preparing a home for sale or rent, count on our fast, affordable service. Our handyman service in the Twin Cities cleans windows, carpets, walls, flooring, and more. We also do preventive maintenance on HVAC systems, and can even help you with excess clutter or get your home ready to show if you’re planning to sell. Our professional plumbers can handle any job, from a plugged sink or toilet to installation of new plumbing for a remodel. Leaky pipes or drains are not a problem for our plumbers. We also install water heaters, sinks, and fixtures, and can create brand new plumbing installations or replace old plumbing to restore proper water pressure and flow. Call us for all of your plumbing needs. Our qualified electricians can do it all, from fixing a broken outlet to installing a complete new electrical service panel in your home. Don’t attempt electrical repairs or installations on your own. Get all electrical work done by one of our fully qualified electricians. We also install smoke detectors, handle telephone and computer network cabling, and install GFI outlets anywhere in your home. From a single accent wall to repainting every room, rely on our painters for top-quality workmanship and efficiency. 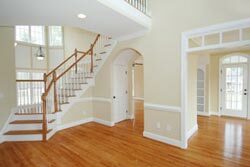 Let us expertly handle the tough painting preparations and masking that make so much difference. We can help you select the right paint for any surface, in any color. We apply all paint with professional skill and equipment. The result is a beautiful interior at an affordable price. Let our HVAC technicians help you with furnace & air conditioning problems. We’re there when you need us. Rely on us for furnace and air conditioner repairs, cleaning, inspections, and preventive maintenance. If your system needs replacement, we can replace most furnaces and air conditioners quickly at highly competitive prices. We also do air duct cleaning to keep your home’s air clean and healthful. From kitchen to laundry room, rely on us for fast, affordable installation and repairs for all your major appliances. Our repair and installation services cover all of your major appliances, including washers, dryers, kitchen appliances, and even entertainment systems for your home. Whatever your needs may be, we have the professionals to handle your job. From replacing woodwork to remodeling any room in your house, no job is too small or too large. One call does it all. The talented, skilled, and experienced carpenters and remodelers from our Twin Cities home handyman service company can transform your home and make it uniquely yours. From creating new rooms and finishing basements to turning a spare bedroom into a home office, we’re on call for you. Look around your home and make a list of all the jobs that need to be done. HandyQuick has you covered, throughout your home. From attic to basement and from kitchen to bath, you can count on our highly skilled craftsmen to repair, create, or remodel your home and make it uniquely yours. Our pricing is always competitive, and our work is always superior. Whether you have just a single job that needs to be done inside your home or a long list of repairs and remodeling ideas that would enhance your home and your enjoyment of it, call our one-stop handyman service. Our professional craftsmen are standing by to handle any task you have. From talented all-purpose handymen to highly-trained trade specialists, including plumbers, electricians, carpenters and painters, our network of courteous, prompt, efficient pros are on call at all times to assist you with any job. We also specialize in prepping homes for sale and getting rental properties ready for new tenants. Call us today, and let us show you how our professional work and quality make all the difference.